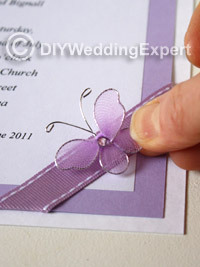 Butterflies are just so pretty and delicate which makes them perfect for a wedding theme. 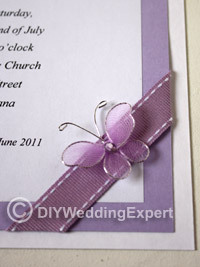 Why not create your own beautiful DIY butterfly wedding invitations by following these easy step-by-step instructions. 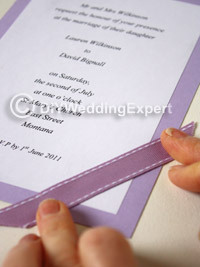 I’ve chosen to use a lilac purple color in the ribbon, card and butterfly motifs. 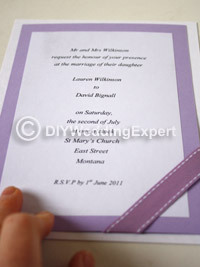 But you could use a color that fits perfectly with your own personal wedding color theme. 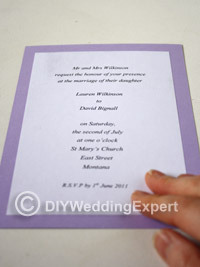 Two sheets of colored card that fit in with your wedding color theme. Line up and cut your background card to the correct size, giving it an even border all the way around. Glue the back all the way around and place it in position. Measure a length of your ribbon across the corner making sure that you have enough excess to fold over the back of the card. Hold in place and turn the card over. 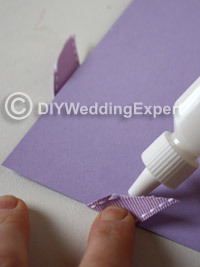 Fold the excess ribbon and glue down. 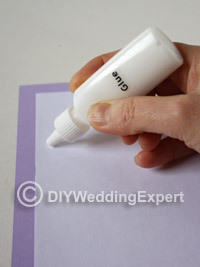 Glue the back of your colored card and carefully place it onto the backing card. Glue your butterfly motifs in position. 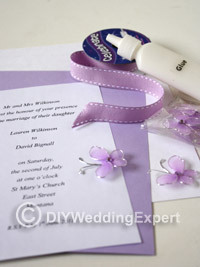 I added one onto the wedding wording as well on the ribbon because I had a space. 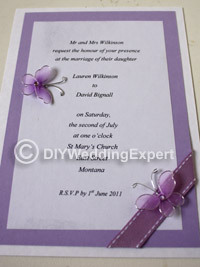 Such a simple but really pretty butterfly wedding invitation that you can easily create for your special wedding day.